An easy and pleasant stage, on good ground, guides the pilgrims to the province of A Coruña. Only the final downhill section to Ponte Ulla, very abrupt, will test the resistance of walkers. The scenery is beautiful, such as in Dornelas. Recommendations are to stop in Bandeira, as there are few locations with services on this stage. The route bids farewell to Silleda from the N-525 towards the fort of Toiriz and later passes through Foxo de Deza, O Espiño, and the recreational area of O Muiíño de Covián, situated 300 meters from the route, from here hikers cross the river Toxa and, on asphalt, reach Chapa before arriving at the N-525 and then continuing to Bandeira, a typical stopping place for hikers as a result of its numerous services. Walkers should take extra care to not follow the signs (that have been crossed out) indicating that the campsite of Medelo is situated on the right hand side. In actual fact hikers should ignore these signs as the campsite is currently closed and instead, those wanting to rest, should continue the Camino and take a turn off further ahead towards the new accommodation hospedaje del Xacabeo that opened in July 2013. Travellers not staying overnight should keep going to the N-525 until arriving at a turn off that leads them to A Casela/Piñeiro/Cira. Reaching San Martín de Dornelas. After seeing the mountain of O Pico Sacro in the distance they will reach O Seixo, where they can have a rest in a bar (that serves sandwiches, snacks and cold meats and, where they can also have the credential stamped). They will pass the church of San Miguel de Castro and then go over an impressive railway bridge. Later on to Noveledo, Hundían and Ponte Ulla. Cyclists should take extreme precautions on the final stretch of the day, as the descent is very steep. La única dificultad a señalar es la ingrime descendente hasta el puente de Ulla. Cuidado con las rodillas porque serán sobrecargados en este descenso. Desafortunadamente teníamos una reserva en la Pensión Cruceiro, y no dejaron de llamarnos porque, no sabemos por qué, cierran el domingo a las 16h. Algunos peregrinos que llegaron después se quedaron a la puerta. Por eso, un domingo, sólo quedamos 3 peregrinos en la pensión Cruceiro con mucha suerte. Los que se quedaron en la barbacoa Juanito tuvieron más suerte. 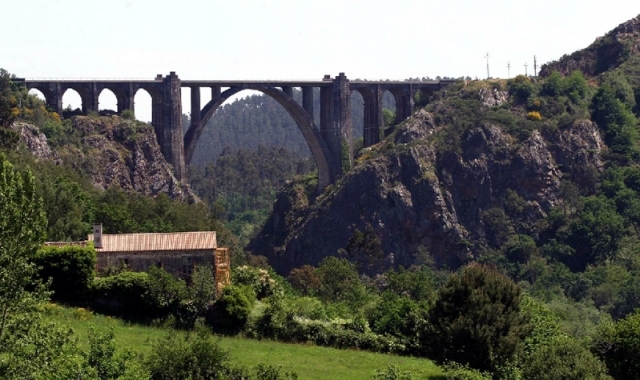 De Puente de Ulla hasta el albergue del Outeiro está lejos. El albergue está aislado y por lo que deben llevar todo tipo de comida y compras. Sin embargo, en el puente de Ulla, los supermercados se cierran temprano. Y si es domingo cierran a las 14h. Por eso, vean bien en qué día pasan en esta etapa. La gasolinera de Ponte de Ulla está abierta las 24h, tienen alimentos, pan fresco, zumos, café y es una aletrnativa a aprovechar en caso de necesidad. 1 reviews Distance to Santiago: 19 km. 1 reviews Distance to Santiago: 40 km. 1 reviews Distance to Santiago: 33 km.